LifeCasting is the art of reproducing any part of the body in a hard stone sculpture. It is a two part process consisting of making a mold of the body part then pouring a casting material into the mold to produce the casting. Lifecasts are exact size replicas with detail down to the fingerprint level. LifeCasting is also very fun both for the model and the lifecaster. Many people have started lifecasting businesses and actually earn money with it. The most common mold material is something called alginate. Alginate is supplied as a powder. It is mixed with water to produce a thick liquid which is applied to the skin. The alginate "sets" to a rubbery solid in a few minutes. In a hand casting, the hand is wiggled free from the mold- in a face casting the mold is simply removed with gentle pressure. Alginate does not stick to the skin at all and removal is very easy. Gypsum cement is the most common casting material for lifecasting because it is inexpensive, very fine grained and highly compatible with the moist surface of the alginate mold. Gypsum cement is chemically similar to Plaster of Paris, but many times harder when fully cured. Alginate is inexpensive, easy to mix, bio-compatible, and very safe. The other molding materials available include silicone and plaster of paris. The first is very expensive and the second doesn't make a very highly detailed casting and can be very dangerous when applied directly to the skin. The main active ingredient in alginate is derived from seaweed. It has been in everyday use worldwide for the past 80 years without a single confirmed allergic reaction. What Body Parts can be Done? If you can think of it, its been done. Hand castings are very common. 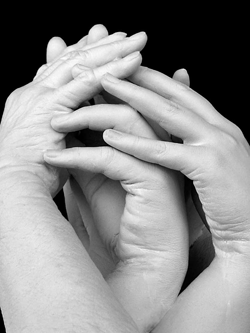 Infants, children, adults, families and the elderly can have hand castings made. Faces, heads, torsos, feet and many other parts are lifecast every day. Accu-Cast offers 8 retail formulas of alginate. Each has a different set of working and setting properties each designed to be optimal for different types of lifecasting. The requirements of an alginate for baby hand casting are very different than those needed for face casting. How Can I Learn LifeCasting? 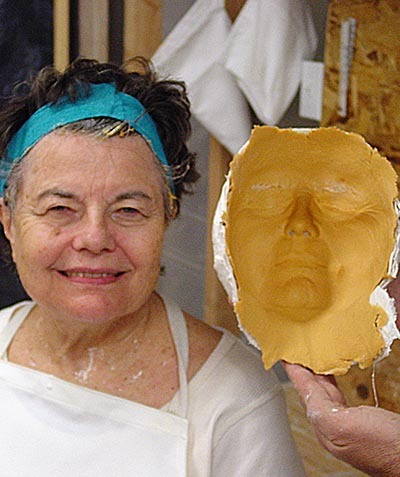 While trial and error is one way to learn, we have found that using one of Accu-Cast's LifeCasting Kits is the quickest and most fun way to learn. Our kits have been developed to maximize the initial success rates for our customers. Once the technique is learned, bulk alginates and gypsum cements are available for purchase. There are also many videos available online. Many of these videos feature Accu-Cast alginates. 1. We make more different formulas than anyone, so whatever your project, we have an ideal formula for your use. 2. Our water/powder mixing ratio 3:2 (water:powder) is more economical than those of our competitors that rely on a 1:1 ratio. Our alginates product approximately 50% more usable product per pound. 3. Our products are made in the US. Some of our competitors have their alginates made in China. 4. Our customer service is excellent. We are available to our customers to answer questions. We've been doing this for over 30 years so what we don't know about lifecasting isn't much.